From Amritsar to Raipur, From Nagpur to Kolkata, From Mumbai to Bangalore and From Hyderabad to Kollam, BANKEDGE – An academy of Banking and Finance has always opened its doors to young graduates from all across India who are aspiring to make their career in Banking and Financial Services (BFS) Sector – and the time has come to welcome a few more through an exciting new education initiative that BANKEDGE has taken in association with Lakshyavedh Consultancy Services at Nashik. 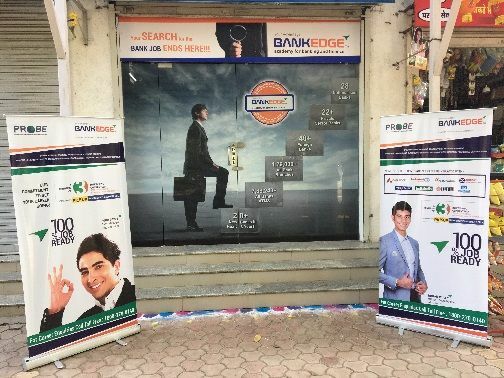 BANKEDGE has confirmed yet another exciting learning opportunity with the launch of its 17th Training Centre at Shop # 3, Lambodar Avenue, A Wing, Plot # 7 to 10, Tidke Nagar, Tidke Colony – Govind Nagar Link Road, Nashik. This flagship training centre will create employment opportunities for young graduates from Nashik city and surrounding areas who have a passion and dream to make a career in Banking Sector. With the first intake of fresh graduates set to arrive for this Diwali, the new recruits can opt to join for an informative 90 days of training program PROBE – Professional Banking Executive Program where they will be trainedby experienced banking professionals toget ready for various entry level job roles in retail branch banking and back-end operations. The education component offers an excellent chance for students to learn various banking skills and pick up qualifications in a new environment via a mix of classroom sessions, one-to-one tutorials, group workshops, online learning modules and tutor webinars. A combination of banking domain skills both through classroom learning sessions and online modules will hone the banking domain knowledge of candidates aged between 21 to 24 years and also offering them a chance to improve their basic soft skills as an added bonus for being the part of the new openings available with leading Private Sector Banks and Financials Institutions. Training Facility includes free courseware kit, examination guide, access to student LMS system and informative sessions and webinars with Banking Experts, specials coaching on communication development and interview preparations and much more. Build banking careers with modern techniques and technology, plus traditionally tested learning models. Yes. BANKEDGE is the right platform one has to select to get placed in a Private Sector Bank or Financial Institution. Details of our programs are provided in our portals which one can go through. Through our PROBE program, more than 5000 students have got placed in Banks and FIs. A serious attempt through our PROBE course and assessment tests/mock interviews, assures you of a placement comfortably. I am MBA appeared and 24 yrs old. Am I eligible for PROBE? Hi Sayali, Yes you eligible for PROBE program. Please visit our nearby center for the further details. Yes you are eligible. Requesting you to please drop an Email with your resume on response@bankedge.in and we will get in touch with you soon. Hi Avinash, yes PROB is a course which will increase your knowledge and understanding with respect to banking and finance. And after completion of the course, we also assist our candidates for placement. Hi Pranav, a candidate who has done his diploma are not eligible for the course. Hi I’m a post graduate from global financial markets from national stock exchange and I have to apply for this course so what is the procedure and fees and do you place in foreign banks…? With Regards to the procedure, we request you to get in touch with our branch team or you may contact us on 1800 270 0140.